Courtney Desiree Morris on the disruptive role of misogynists in radical organisations, and how it opens the door to state violence both indirectly and in some cases via police informants. On Democracy Now! Malik Rahim, former Black Panther and cofounder of Common Ground in New Orleans, spoke about how devastated he was by Darby’s revelation that he was an FBI informant. Several times he stated that his heart had been broken. He especially lamented all of the “young ladies” who left Common Ground as a result of Darby’s domineering, aggressive style of organizing. And when those “young ladies” complained? Well, their concerns likely fell on sympathetic but ultimately unresponsive ears—everything may have been true, and after the fact everyone admits how disruptive Darby was, quick to suggest violent, ill-conceived direct-action schemes that endangered everyone he worked with. There were even claims of Darby sexually assaulting female organizers at Common Ground and in general being dismissive of women working in the organization. 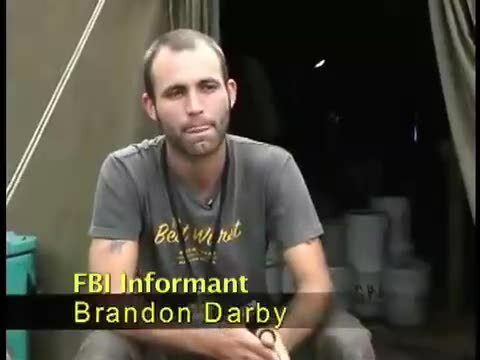 Darby created conflict in all of the organizations he worked with, yet people were hesitant to hold him accountable because of his history and reputation as an organizer and his “dedication” to “the work.” People continued to defend him until he outed himself as an FBI informant. Even Rahim, for all of his guilt and angst, chose to leave Darby in charge of Common Ground although every time there was conflict in the organization it seemed to involve Darby. We have a right to be angry when the communities we build that are supposed to be the model for a better, more just world harbor the same kinds of antiqueer, antiwoman, racist violence that pervades society. As radical organizers we must hold each other accountable.